Trion Worlds says players who have pre-purchased End of Nations will soon be contacted with more information. What we've seen of the free-to-play MMORTS End of Nations so far looks pretty cool. 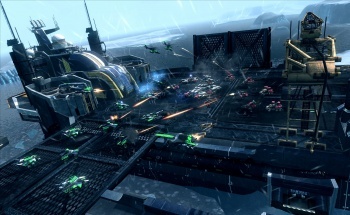 Gameplay trailers have been suitably action-packed and intense, and Mike Kayatta named it one of his "five favorites" of E3 2012, calling it "one of those sought-after 'easy to learn, hard to master' games that only need as much of your time as you're willing to give." But in spite of all the pre-release positivity, it would appear that something, somewhere hasn't gone quite as smoothly as expected. "Thank you all for your support over the past few months while we have been testing the game in Closed Beta. While we received an incredible amount of positive feedback, the Closed Beta tests also identified several key areas of the game which need polish and improvement," the team wrote on the End of Nations Facebook page. "As a result, we have decided to postpone the Open Beta phase of testing until further notice. We will let you know as soon as we have an update," it continued. "Those players who made an End of Nations purchase should expect to receive a follow-up email shortly. Thank you in advance for your continued input and support. It is greatly appreciated." Trion Worlds made the game available for pre-purchase in three separate editions, offering buyers guaranteed access to the beta and other bonuses. VG247 said those who bought the game will be given refunds, but there's no indication that a money-back deal is actually on the table. If you bought the game and receive a refund offer in the follow-up email, feel free to let us know. UPDATE: Alex van Dijk has sent over a copy of the email he received from Trion Worlds which confirms that everyone who purchased the game will get their money back. "We will automatically process a refund for your purchase shortly," the email says. "You will receive an email confirmation of the transaction once your refund has been completed." 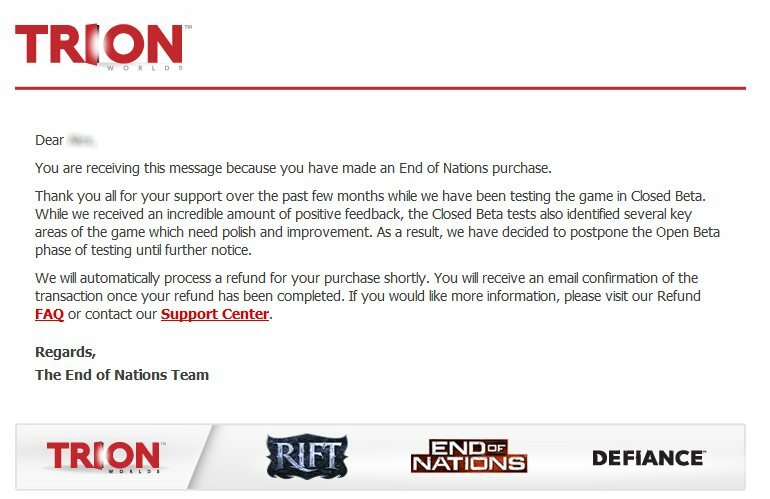 The Trion Worlds support site also revealed that End of Nations has been taken offline completely and will remain down as work on the game continues.